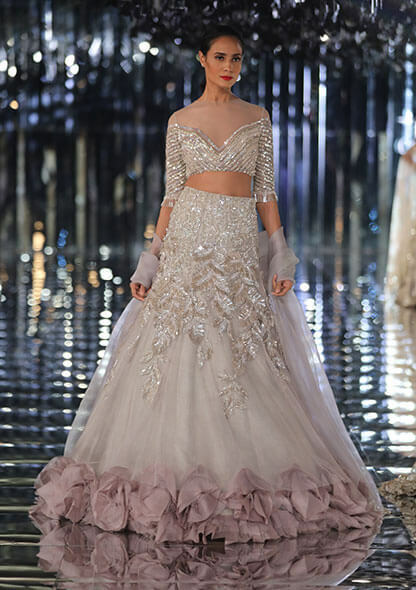 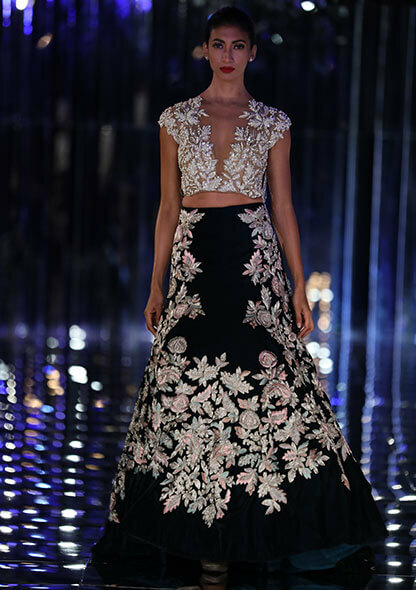 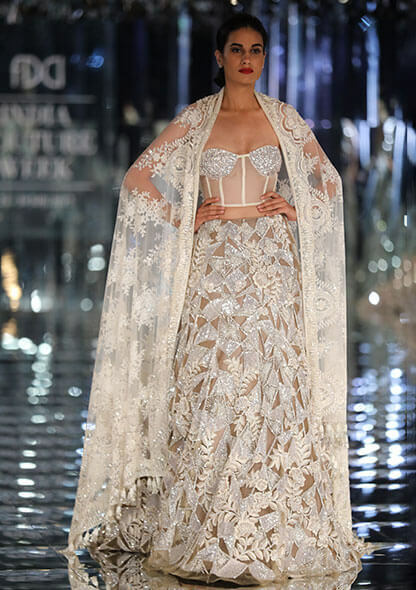 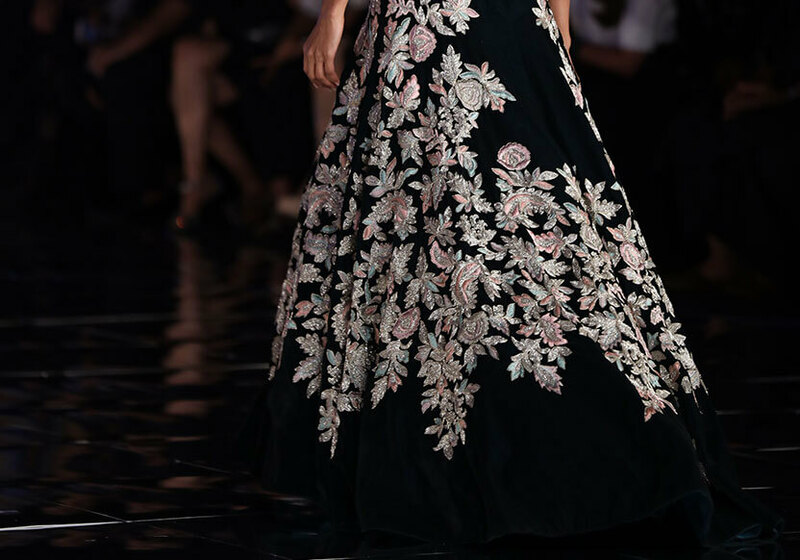 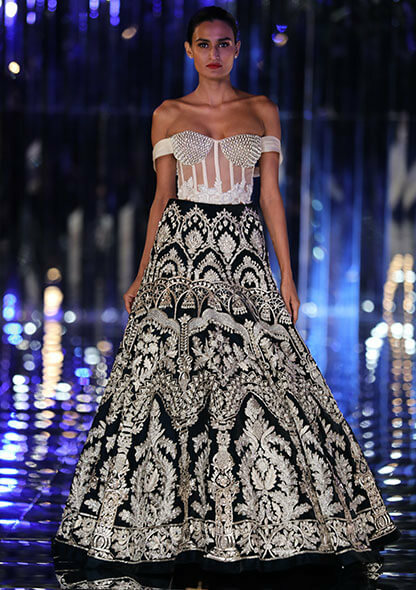 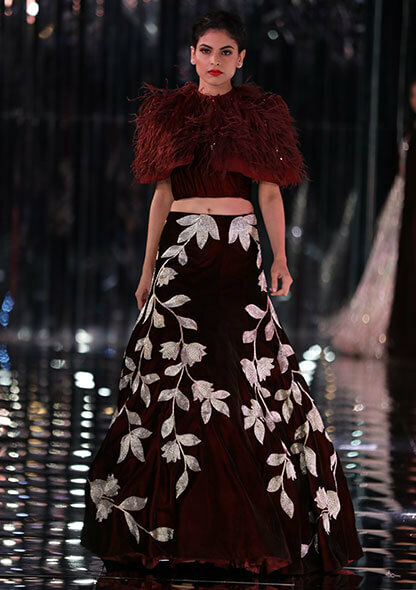 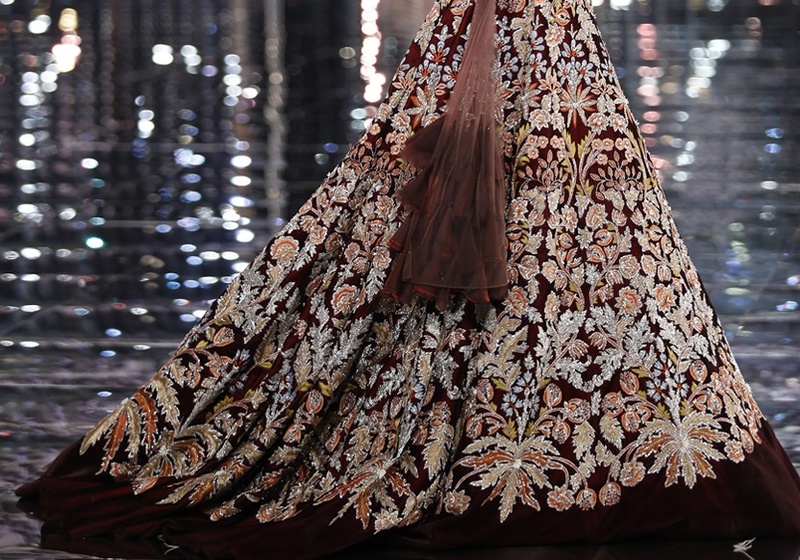 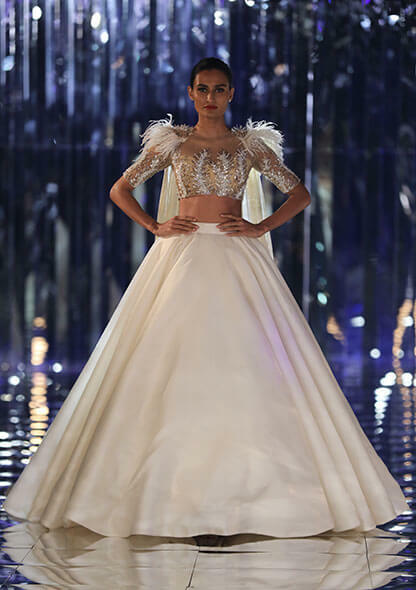 SENSUAL AFFAIR weaves together the subtle nuances of modern artistry with the intricacy of true couture; voluminous, billowing skirts with embroidery art, fitted corsets and shimmering cascades. 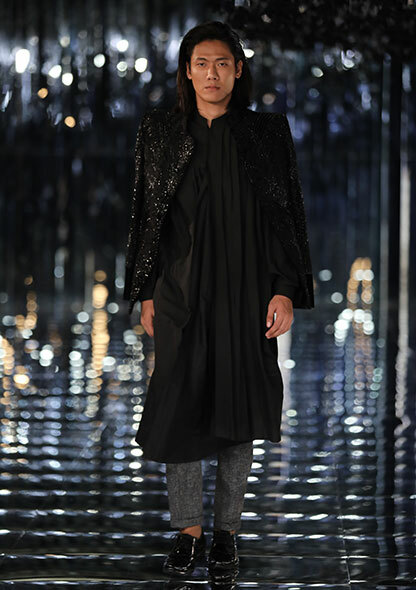 The label has refined its silhouettes to accentuate the curves of a woman’s body. 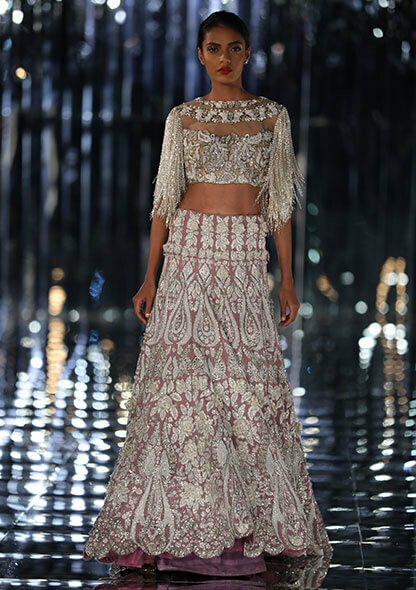 With three-dimensional embellishments, layered motifs and elaborate juxtaposition of texture, the label has astutely traded formal couture with flowy silhouettes and infinite skirt trails. 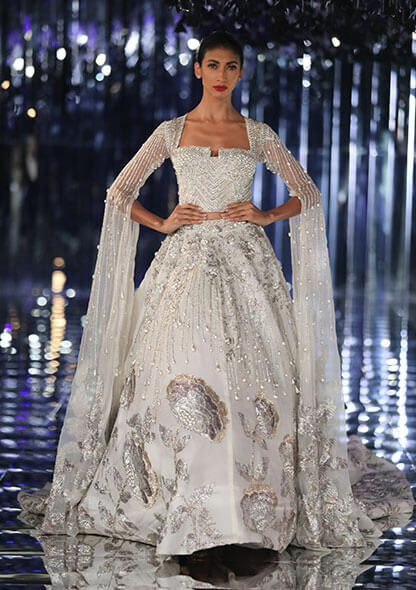 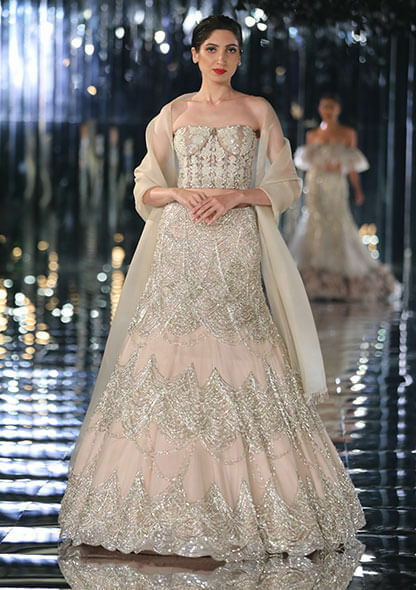 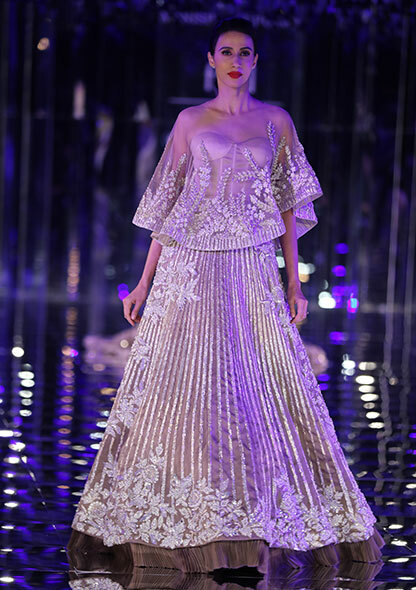 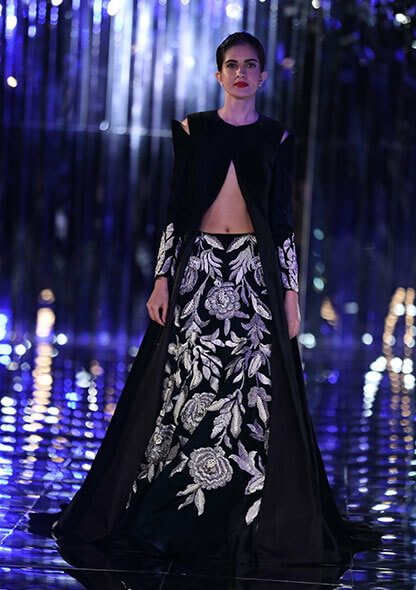 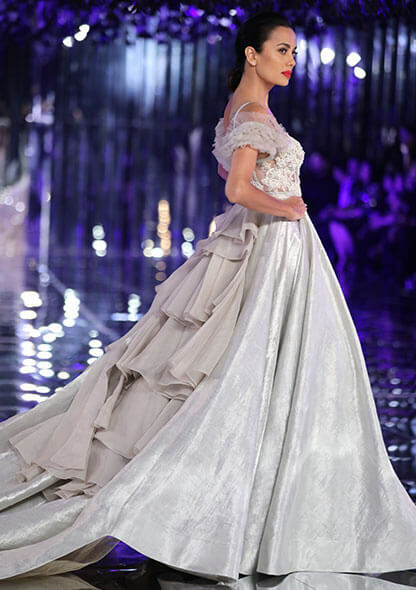 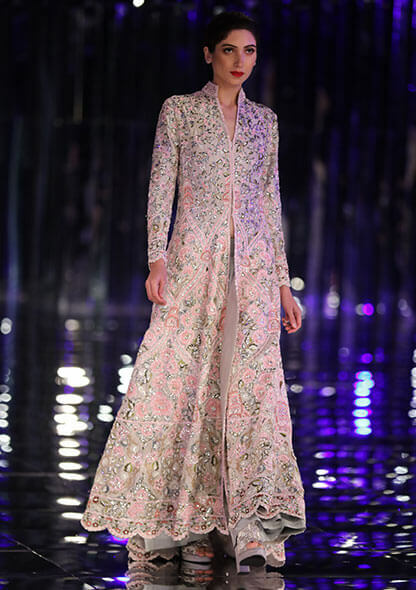 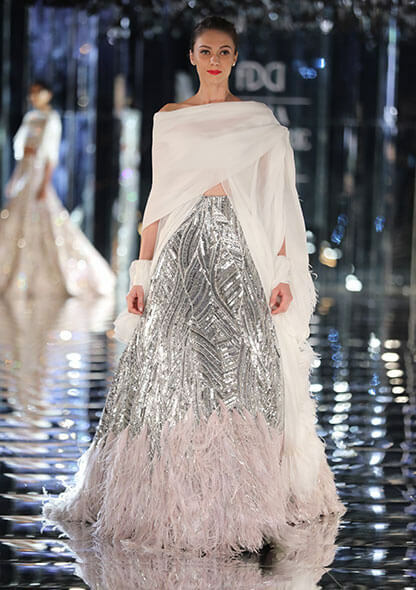 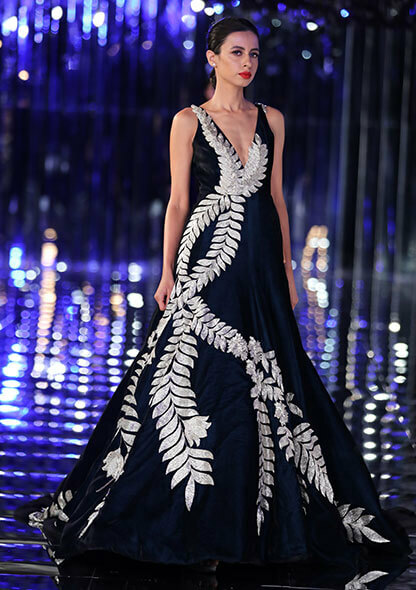 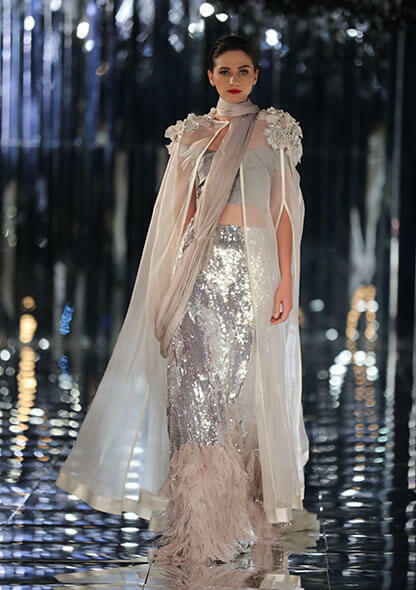 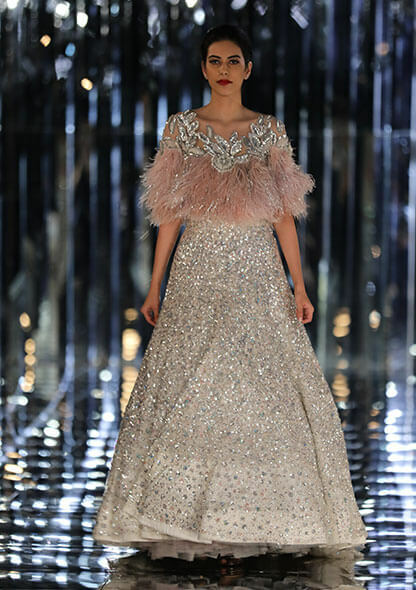 The collection presented a selection of 85 exquisite outfits, an array of rich fabrics such as satin organza, silk tulle, micro velvet, satin velvet, two-tone silks, brought to life using antique metallic threadwork, pearls and luminous crystals. 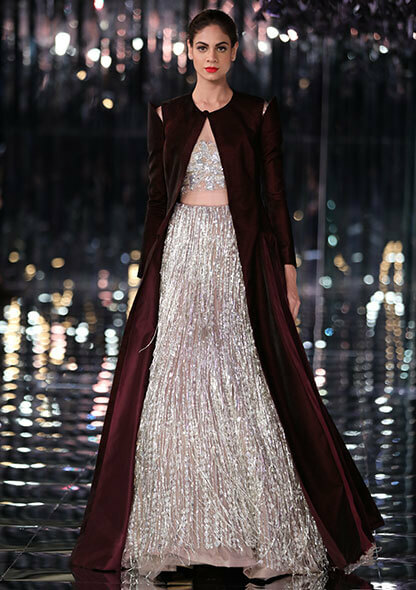 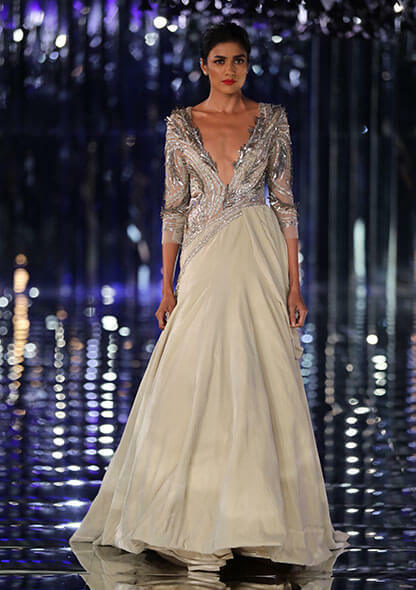 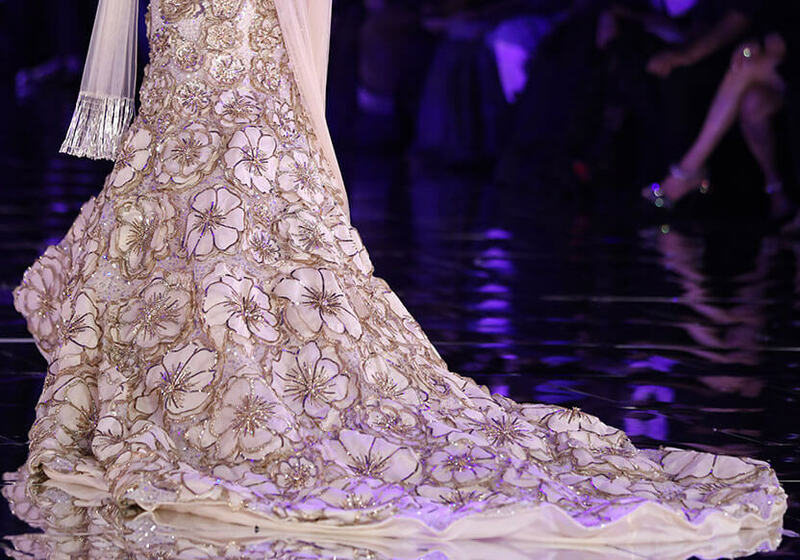 Swirls of sequins and swathes of shimmer and sheer play with light, like a canvas of a dreamy illusion. 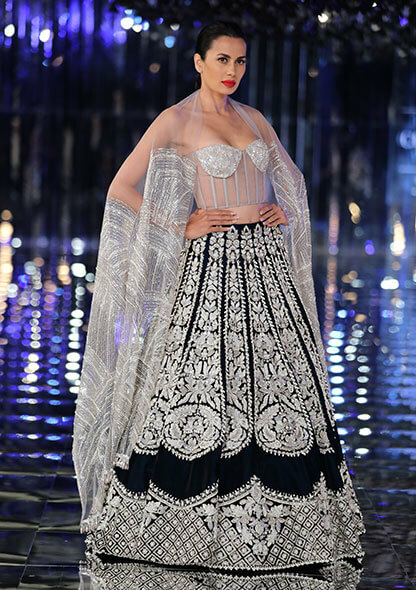 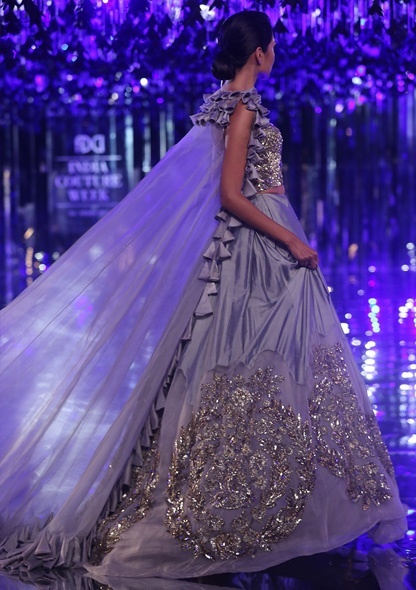 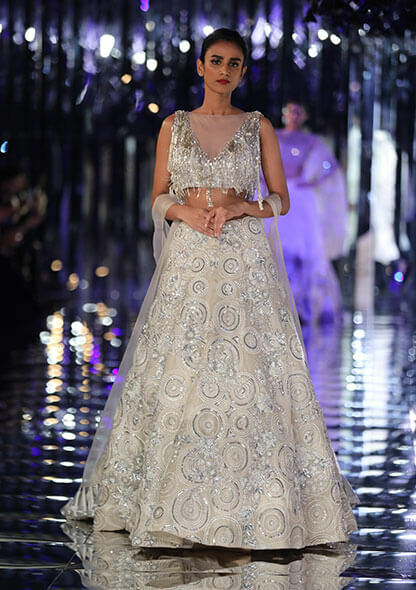 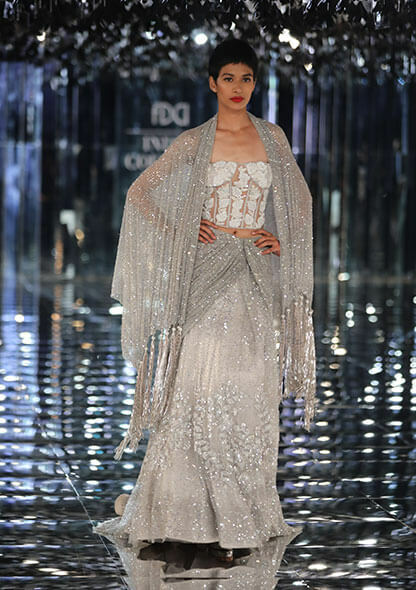 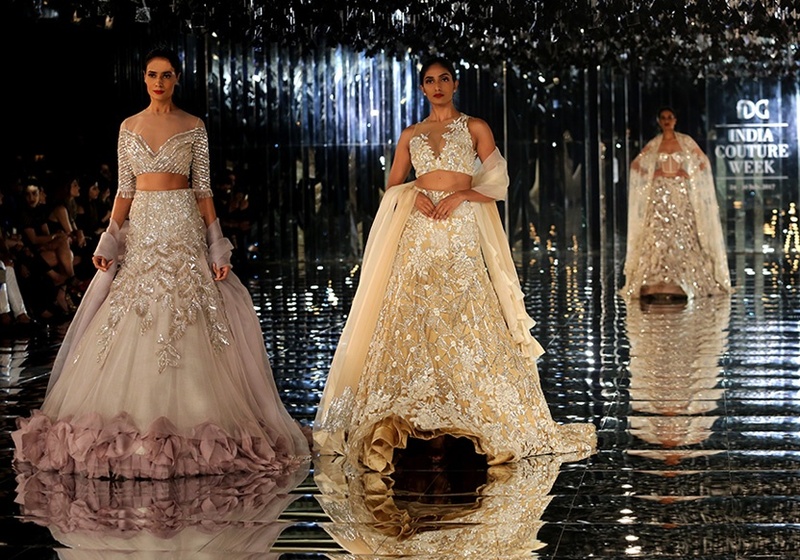 Voluminous gowns and billowy lehengas have been crafted in shades of ivory, soft grey, vintage rose, burgundy and teal. 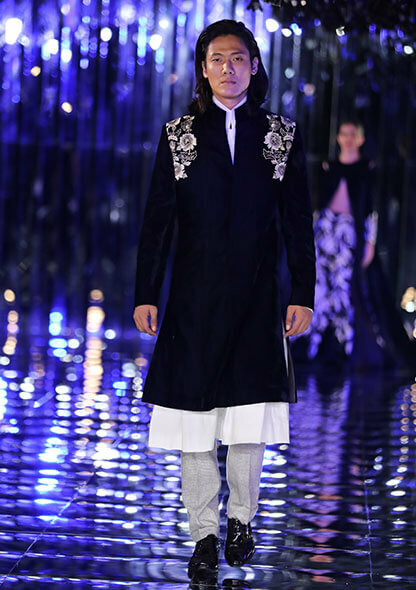 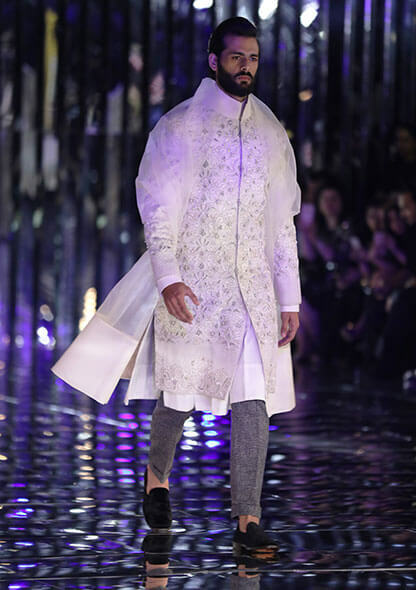 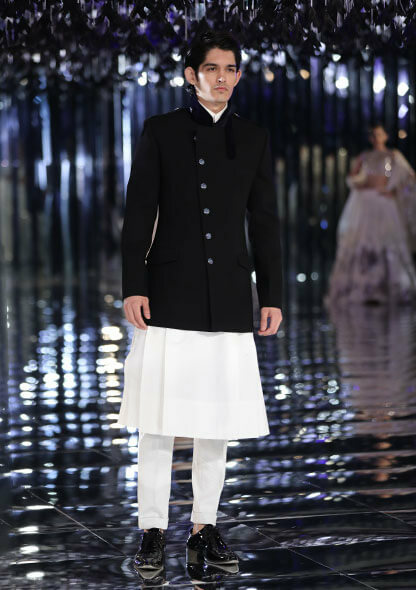 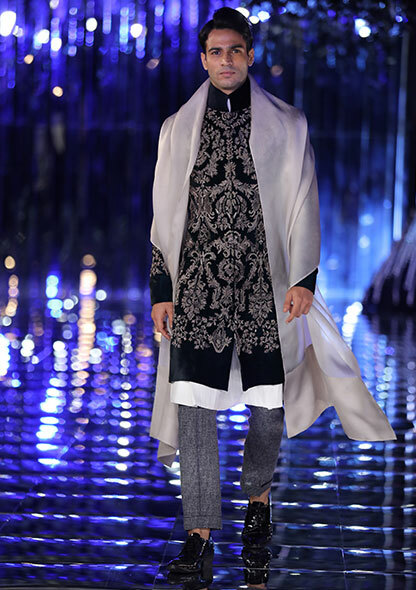 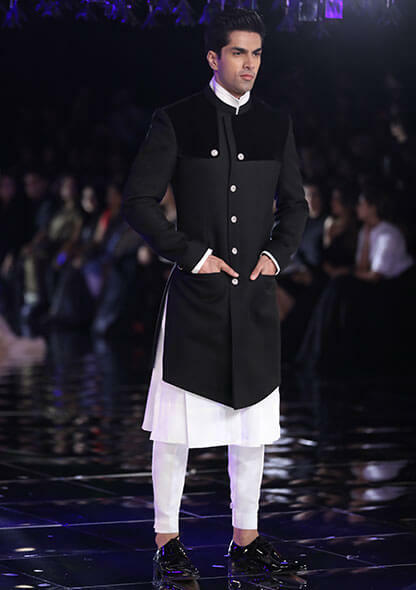 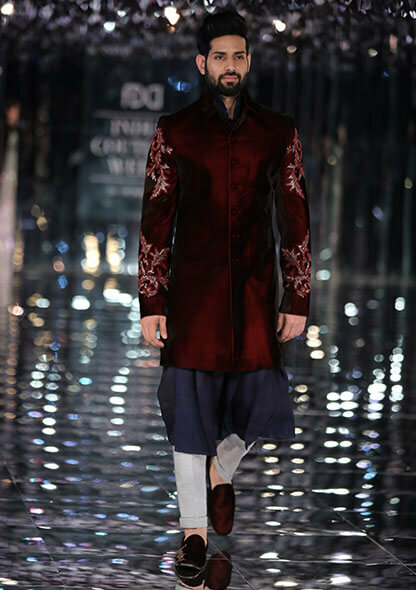 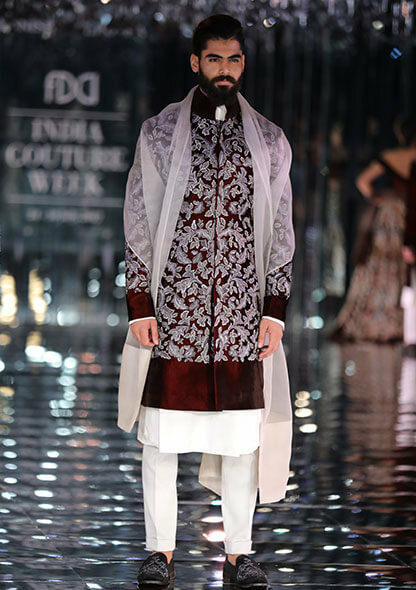 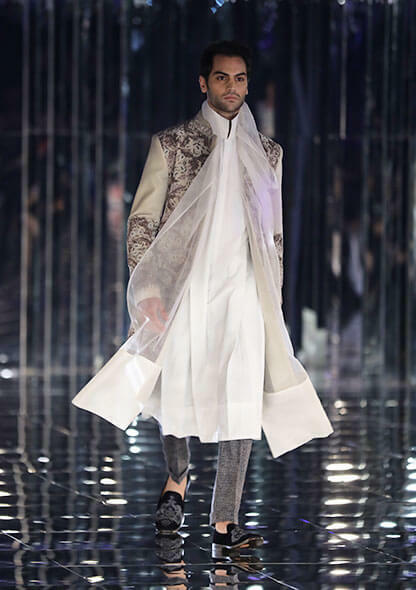 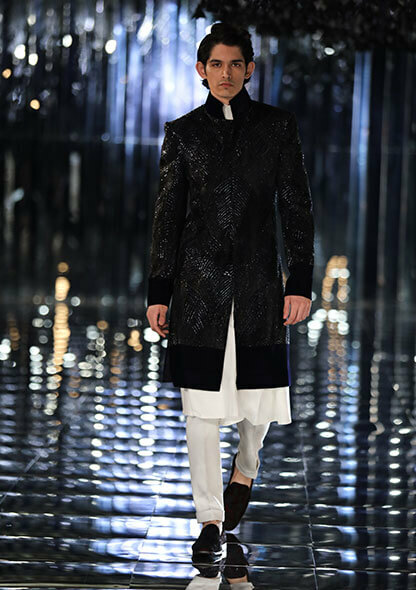 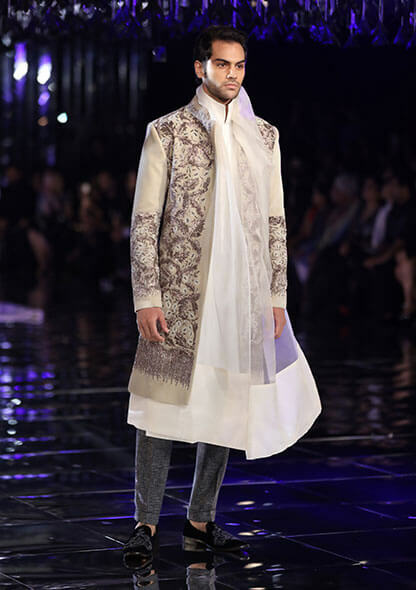 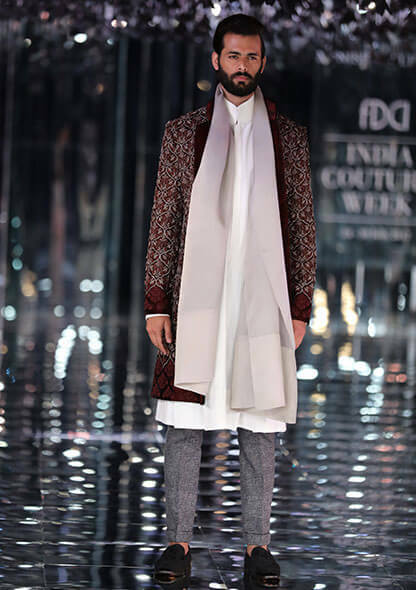 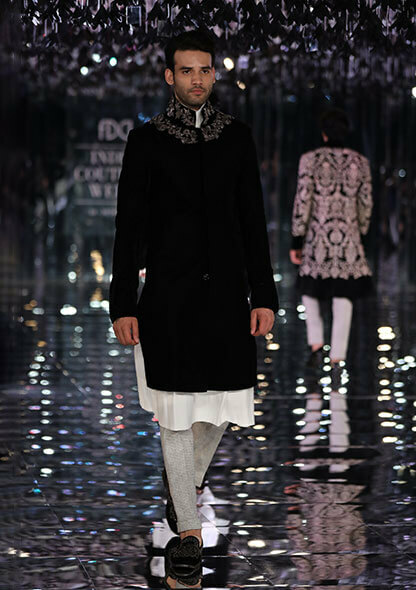 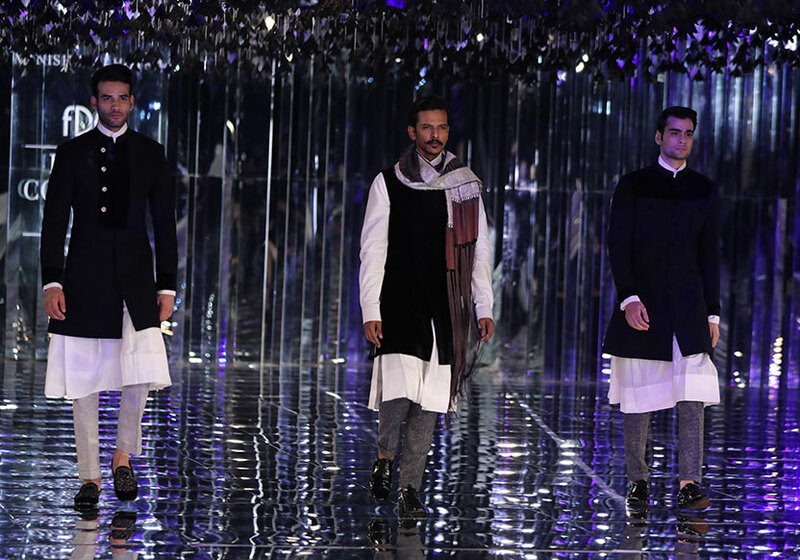 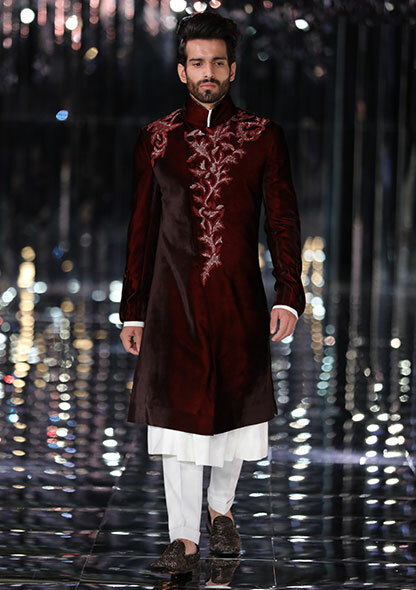 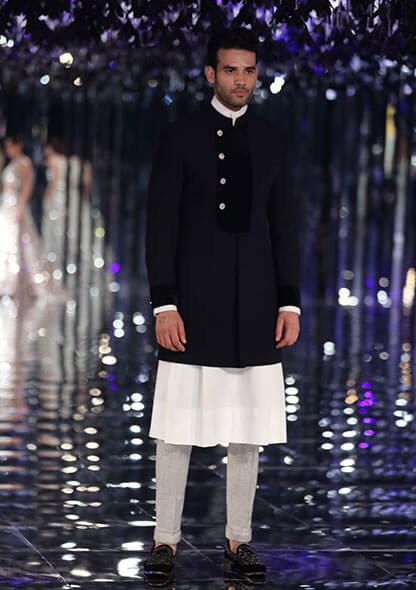 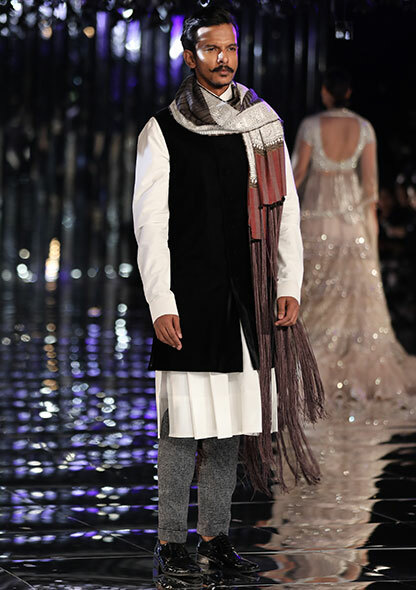 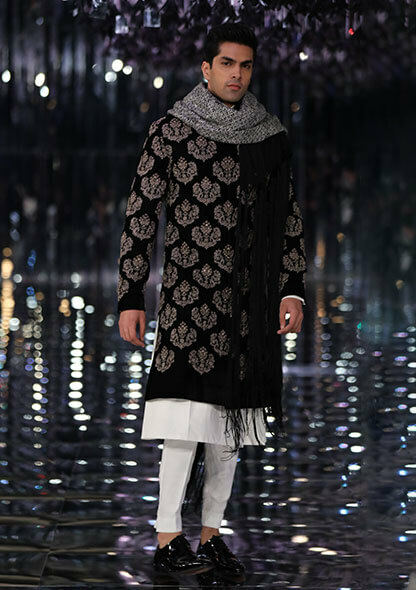 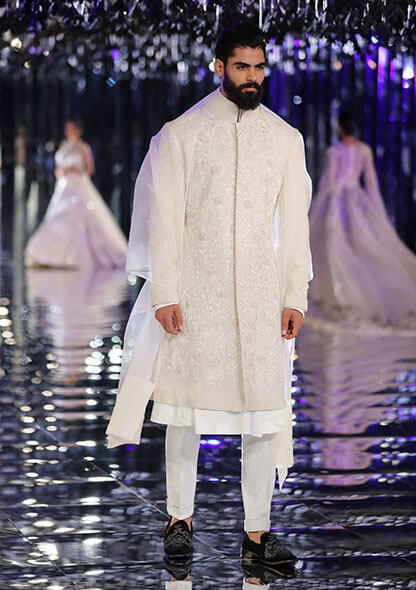 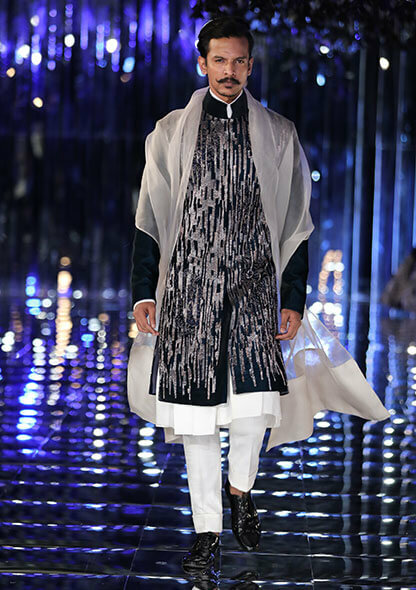 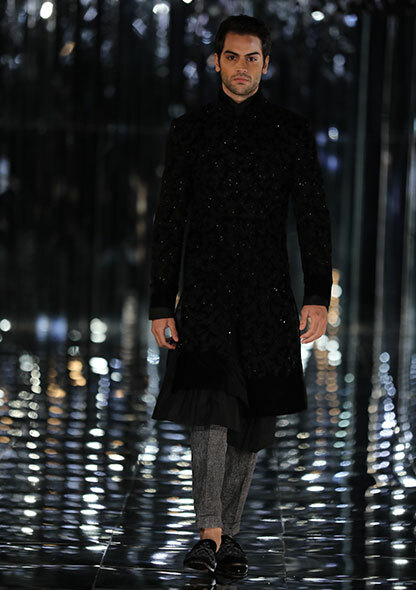 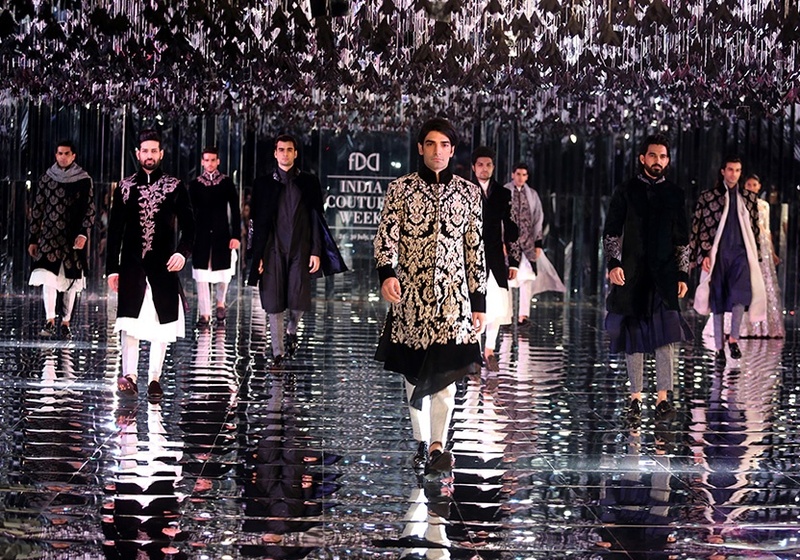 For the men, structured sherwanis have been contrasted with fluid kurtas to create a bridge between the conformist outer-self and the liberated inner-self. 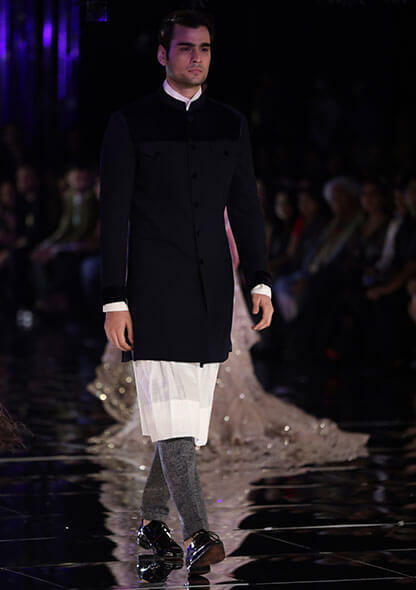 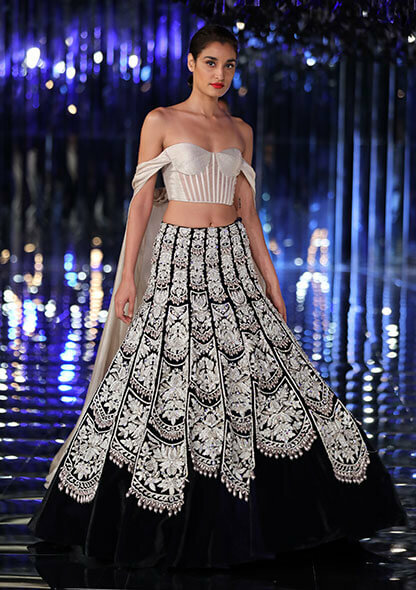 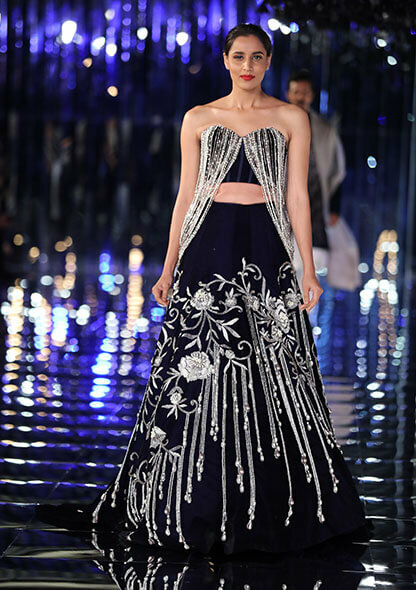 The showing concluded with the charming Ranveer Singh in a midnight blue zardozi and thread-work embroidered sherwani paired with slim pants while Alia Bhatt looked ethereal in a sequined pearl embellished top with an olive 3D floral detailing multi-layered ruched net skirt.